Joanna’s passion for hair styling is only exceeded by her passion for hair color. 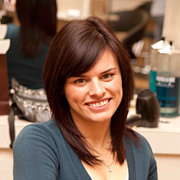 As a trendsetting and innovative stylist she consistently surpasses her client’s expectations. Thoroughly educating her clients on at home care, Joanna gives you the confidence to replicate your style. A believer in giving back, Joanna participates in Locks of Love, providing many of her clients wtih new styles so they can help those less fortunate. Each and every client she sees reflects her passion for the industry and devotion to customer service.